Here is my 3rd post on this holiday season's kamikaze baking session. If you haven't read the first two they are Kamikaze Holiday Baking - My Story and Tips for the Brave at Heart which covers my decision to approach the holiday baking in this fashion and Something Old - Kamikaze Baking Part One which shares the recipes pulled from my past that offered tradition to the goodie gift plate. What you have in this blog are the new recipes my daughter and I found to try. Don't know if all will make it in the long run onto the Holiday recipe collection, but a few surely will. I hope you enjoy all 3 postings. The first also shows how we will be packing our goodies plates this year. I found this recipe at Smitten Kitchen, It is adapted from one in Bon Apetit, December 1999 - so new to me, but with traditional roots. For those who like lots of step by step images to follow, I have included the hyperlink to her website. This was my personal favourite from all our baking this season. 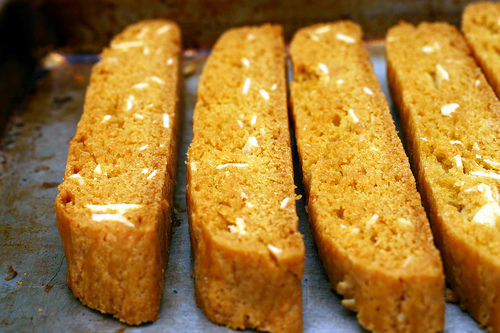 I love Biscotti because it's not overly sweet and sugary. The smell of the orange rind is divine and these are bare bones - no icing drizzles on top or ends dipped in caramel. Pure and simple, it's perfect in my mind. 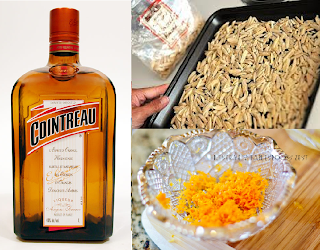 The only change I made was to add 2 T of Cointreau instead of 1 as I love the flavour it imparts. In looking through the comments, I noticed several raved about Alice Water's Biscotti recipe from her cookbook The Art of Simple Food. Here is one comment - " May I also recommend Alice Water’s recipe in her new “The Art of Simple Food.” I use her recipe as a base and then tweak it to make chocolate chip and hazelnut biscotti or dried cranberry and walnut biscotti. Both are equally delicious!" I have put this high on my list of ones to try. In a website search I found the recipe at A Wooden Nest. Divide the dough in half. Using floured hands, shape each dough half into a 13-1/2" long and 2-1/2" wide log. Transfer both logs to the cooking sheet lined with parchment paper. Whisk the egg white until foamy and then brush over the top and sides of each dough log. Bake until golden grown - about 30 minutes. The logs will spread so make sure they are separated on the sheet. Transfer to wire rack and cool for about 25 minutes. Maintain oven temperature as they go back in a second time. Transfer logs to work surface and discard parchment paper. Using serrated knife, cut logs on diagonal into 1/2" wide slices (can be straight across as well). Arrange slices, cut side down, on same baking sheet. Bake 12 minutes. 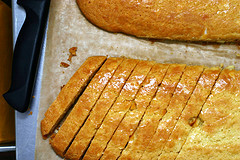 Turn biscotti over, bake until just beginning to colour, about 8 minutes. Transfer to rack and cool. These last about 1 week in an airtight container. As this is my first year making, I am freezing some for the plates. Hopefully they last longer in the freezer and don't become soft. Now for my daughter's favourite. These were a bit of a journey. When we talked in terms of new recipes, I envisioned a variety of tastes. It's always easy to find those with chocolate and lots of sugar, but you need variety to make holiday baking truly interesting. 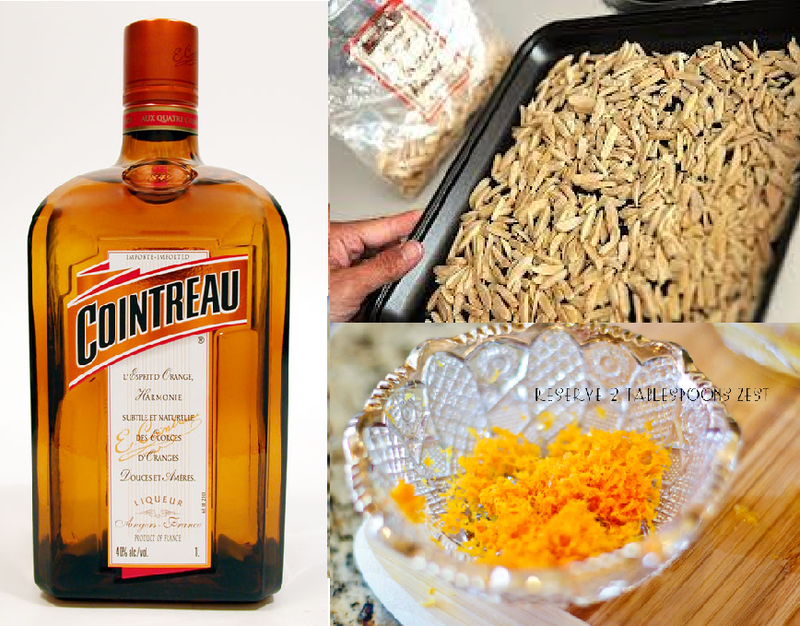 There is orange in the recipe above so I did a search for lemon. These had a great taste. Our only problem was with the instructions. We spent 2-3 hours searching for the pastry bag and large star tip to create the cookies the way the recipe said only to be stymied. Even my 6'5" husband could hardly squeeze the dough out of the tip. The dough tasted great, so we quickly changed to rolling small balls and voila! They have a great taste and the finely chopped pistachio with their green tint give it a great holiday look. However, the original piped version is so much better looking!!! Still wish we could do the rosettes, but not worth the trouble. If you want to try piping or want to see the original look of the cookie - you can go to Redbook for the instructions. They also give instructions there for using a mixer to create this recipe. Preheat oven to 350 degrees. Cream butter and sugar. Add baking powder, salt, egg yolk, lemon zest, lemon juice and vanilla extract. Mix until well combined. Add flour and gently work in until a dough is formed. Form small balls using about a tablespoon of dough and place on ungreased cookie sheet. Bake for 10-12 minutes, just until set. Depending on your oven and the size of the cookies it could take less time. 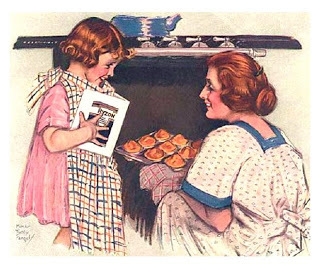 What you want is a very light golden brown bottom and the cookie set (a weird term but as you bake more you will understand). First I lightly touch the top and then I lift one cookie to check the underside. This is where you see if it is lightly brown. Cool on baking sheet on wire rack for 5 minutes, remove cookies and cool on wire rack completely. Melt white chocolate in double broiler or in heat proof bowl on tap of simmering pan of water until smooth. 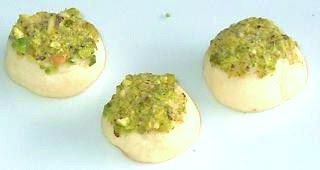 Gently pick up a cookie, dip in the melted white chocolate and then in the finely chopped pistachios. Let stand until chocolate sets and store in an airtight container. 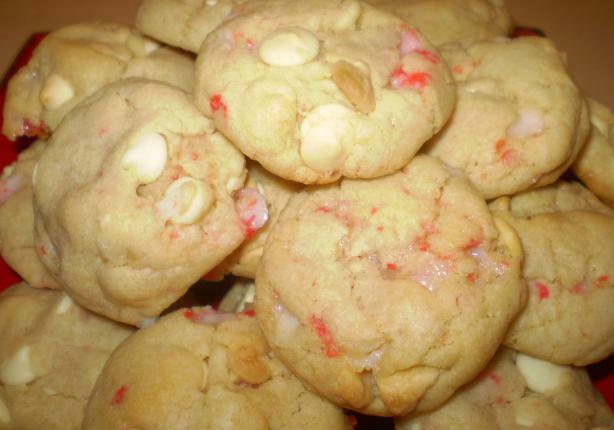 What can I say about Peppermint White Chocolate Chip Cookies? This was a journey and I never really made a final version. The recipe is from Food.com. I had found an interesting package of Ghiradelli candies called Limited Edition Peppermint Bark Squares and wanted to use them. I thought this recipe might work. Instead of putting the white chocolate baking chips inside, I could press a small square of the bark on top after pulling them out of the oven. Well - the first batch burned. The temperature and cooking time didn't match up. Then on my second try I had a batch on the parchment paper slide off the sideless baking sheet and end upside down on the floor. Third try was the charm, BUT the candy canes really are chewy and I think having the chocolate inside the cookie is a better idea. In the end, I loved this addition to the holiday mix - truly outside the box - but I will put the white chocolate chips in and just melt a little additional white chocolate to drizzle on top to make them look a little more festive. Note - place in a large Ziploc Freezer bag (more durable) and crush with rolling pin or hammer. Cover cookie sheets with parchment paper. Cream butter and both sugars until light. Stir in vanilla, eggs, salt, baking soda and candy canes until well mixed. Add flour and combine until dough. Add the white chocolate chips and stir until well mixed. Drop by level tablespoonfuls onto baking sheets covered in parchment paper. Bake at 375 degrees for about 10 minutes. (Original recipe said 12, but mine burned. I started check at 8 minutes and pulled them out as soon as I saw the bottom of the cookie I checked was lightly brown. Cool on rack. If you want to pretty them up, melt the extra white chocolate in double broiler or in heat proof bowl on top of simmering hot water and drizzle over the cookies in a zig-zag pattern. When cool and chocolate (if used) is set. Store in an airtight container. Necessity if the mother of invention. I had some shredded coconut that needed to be used up and gave Danielle the job of finding a recipe to use it up. She decided on some for of tart to give the look of the holiday plate a new twist. I love the recipe she found - Chocolate Orange Coconut Tarts from Flavours Magazine - but it only used the coconut in the crust. We decided to simply the recipe by using frozen pre-formed mini tarts from the grocery store (18/box) and added coconut to the filling - only a half recipe which was about right. I think they're great. I particularly love the addition of the marmalade which gives the tart an added flavour dimension. Bake shells per directions on side of box. Cool on rack. In saucepan on stove, bring cream and marmalade to a simmer and then turn off heat. Add chocolate, liqueur and coconut. Stir until smooth. Using a large spoon. fill each pasty shell to top. Sprinkle a small amount of coconut on top to decorate. Cool until filling is completely set and the store in an airtight container. I originally noticed a recipe for Espresso Chocolate Shortbread in Fine Cooking Magazine's "The Best of ....Appetizers" at the grocery store. It wasn't bad, but it wasn't exceptional. If you want to err on the side of caution, it would probably be fine, but for Danielle and I we wanted to offer a selection of interesting flavours that stood on their own. An Internet search turned up this recipe on I don't know how many websites - amazing. I have to admit I personally struggled with it technically. Getting the dough out of the bag without it breaking apart is a true skill and I'm not sure I really love the look of the knife cut squares for a holiday plate. With the chopped chocolate square which I preferred, it was a little hard to judge when they were lightly brown and mind ended up darker overall, not sure why yet. So I will probably be trying a few different techniques and shapes when I make it again, BUT it has a good strong espresso/chocolate flavour and seems to be one of the most tried and true recipes out there. For a great step-by-step pictorial, I liked Amandeleine's blog. Position the racks to divide the oven into thirds and preheat the oven to 325 degrees F. Line two baking sheets with parchment. Put the plastic bag on a cutting board and slit it open. Turn the firm dough out onto the board (discard the bag) and, using a ruler as a guide and a sharp knife, cut the dough into 1 1/2-inch squares. Transfer the squares to the baking sheets and carefully prick each one twice with a fork, gently pushing the tines through the cookies until they hit the sheet. Bake for 18 to 20 minutes (Too long for my oven, I would do 16 min. next time), rotating the sheets from top to bottom and front to back at the midway point. The short breads will be very pale–they shouldn’t take on much color. Transfer the cookies to a rack. An option is to dust them with powdered sugar after baking, but to me that's messing with the taste. How this recipe from the same Fine Cooking Appetizers magazine did work out great. What drew me to it was the use of fresh cranberries as well as the fact read like something all my relatives would make. Finding things that are more traditional is a perfect way to round out the holiday gift plate. It did take a little longer and we both struggled to decide when it was done at each step of the way, but despite it all it turned out exactly the right way. The original recipe had walnuts, but I had Pecans to use up and do fine walnuts (unless they are very fresh) have an odd after taste. The substitution worked with a hitch. Of you would like to view it on the official Fine Cooking website by clicking HERE. Position a rack in the center of the oven and heat the oven to 350°F. Line a 9x13-inch baking pan with foil, leaving a 2-inch overhang on the ends. Spray the foil with cooking spray. For crust and topping - in a food processor, finely grind 1/2 cup of the pecans with the sugar. Add the flour, baking powder, and salt and pulse to blend. Add the butter and pulse until it’s the size of small peas, 5 or 6 one-second pulses. Set aside 1 generous cup of this mixture. Add the egg to the mixture remaining in the food processor and pulse just until the dough begins to gather into large clumps. With your fingertips, press the dough evenly into the bottom of the prepared pan. Prick the crust all over with a fork. Bake until the edges are light golden brown and the center looks dry, 15 to 20 minutes. Cool the crust on a rack. For the filling - in a medium saucepan, combine 2 cups of the cranberries with the apples, sugar, maple syrup, brandy and salt. Bring to a simmer over medium heat. Cook, stirring occasionally, until the sugar has dissolved, the cranberries have popped open, and the mixture is thick and syrupy, 4 to 6 minutes. Remove the pan from the heat and stir in the remaining 1 cup cranberries. Scrape the cranberry mixture onto the crust and spread evenly. Knead the reserved pecan mixture with your fingertips until it becomes clumpy. Coarsely chop the remaining 1/2-cup Pecans and add to the topping. 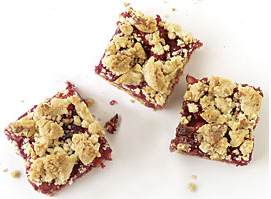 Sprinkle over the cranberry layer, pressing the streusel between your fingers into small lumps as you sprinkle. Bake until the topping is golden, 20 to 25 minutes. Let cool in the pan on a wire rack until just warm, about 1 hour. Carefully lift the bars out of the pan using the foil overhang, peel back the edges of the foil, and cool completely on the rack. Cut into pieces. They say 24 but for Xmas plates I always to 30 - 6 rows crosswise and 5 rows lengthwise. 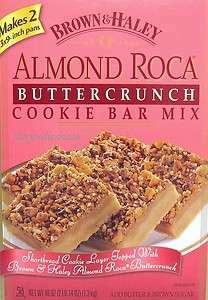 In closing I want to mention on treat we made using a mix because it was one of Danielle's top picks - Almond Roca Buttercrunch Cookie Bar Mix by Brown & Haley. We picked this up at Costco, so a real bargain, and the box contained enough for 2 recipes (9 x 13 pans). In looking at the site it appears this might be a seasonal item.